STEP 2. In your product list, click the Edit button on your chosen product. 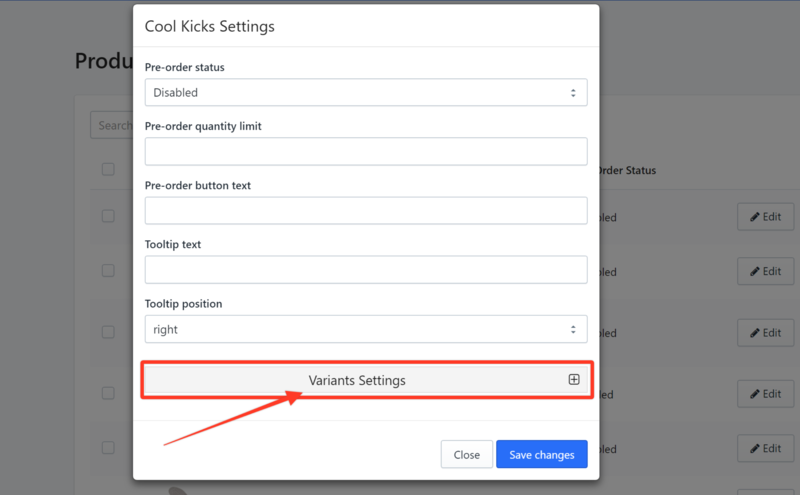 In this example, we choose Cool Kicks which has six variants. STEP 3. Click the drop-down arrow and set the Pre-order status to Enabled. STEP 4. Scroll down to the Variants Settings section and click on it. STEP 5. Click on the variant of the product that you want to set pre-orders. In this case, the variant is small/blue. STEP 6. Click the Pre-Order status drop-down arrow and set it to Enabled. STEP 7. Specify a maximum number of items for this variant that can be pre-ordered in the Pre-order quantity limit field. In this example, we enter 5. STEP 8. Enter the text that you would want to appear as your pre-order button in the field provided. In this example, we use Shop ahead. STEP 9. In the Tooltip text field, enter a short phrase that you would want to appear when the mouse hovers over the Shop ahead button that you have set. In this example, we use Order now to reserve a pair! STEP 10. Set a spot where your tooltip would appear when the mouse hovers over the Shop ahead button. In this example, we choose bottom-right. STEP 11. Repeat all the steps in each variant that you want to set pre-order settings to, according to your preference. STEP 12. Click Save changes. Your Pre-order settings will now apply to the variant of the product that you have chosen.